Susan Mulcahy has a few stories to tell. The May/June issue of Politico magazine has a fun set of pieces about Donald Trump. One, by Campbell Brown, examines the culpability of cable news channels in building up the Trump celebrity brand. 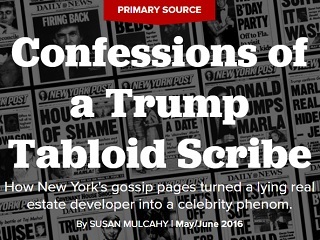 Another, by Page Six and Newsday vet Susan Mulcahy, looks back at what it was like to cover Trump in the 1980s. Lincoln West was the largest piece of undeveloped land in Manhattan when Trump took it over in the mid-1980s. The property, which stretched from 59th to 72nd streets, for a time had been known as Television City, when it looked as though NBC would be the anchor tenant in an enormous new complex. To entice the TV network, which had been making rumblings about moving from Rockefeller Center to New Jersey, Trump needed to offer below-market rents, and for that he required tax abatements. He didn’t get them.